Like its setting, a deep, dark, underwater cave, Sanctum is a cold experience. People go diving, things go awry. That sums up Sanctum in its entirety. 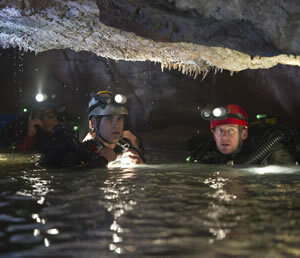 The action takes place in the Esa’ala caves of Papua New Guinea. It doesn’t bode well when a title card proclaims the story was “inspired by” true events. In Unstoppable, that same proclamation was an open license to bastardize reality. As it turns out, this underwater adventure was “inspired by” co-writer and producer Andrew Wight’s real-life experience. But that ordeal was 23 years ago and involved the underwater entrapment of 15 cavers; they all survived. Apparently Wight’s modesty is also a fair match to co-producer James Cameron’s; Sanctum is a release from the Great Wight Productions shingle. Father-son tensions, ego clashes, love interests, and an impressive body count at the hands of Mother Nature and human recklessness all play a role in this - come on now - fictional tale. Sure, the world’s a stage. But Sanctum is a bunch of bunkum. Filmmakers’ hubris aside, Sanctum makes several cardinal sins. It invests no time in developing the characters before the tensions begin, so there’s no reason to root for anybody. There’s no set up of the situation to explain the significance of the group’s activities. One aerial shot shows a massive, awesome opening in the earth, then gung-ho explorers go repelling or BASE jumping down into the darkness, impending storms and flood warnings be damned. And there’s no real explanation of the goal driving the expedition or what the explorers hope to learn or find. Yeah, the site is huge, but what else makes it significant? What makes what they’re doing significant? In space no one can hear you scream. Underwater no one can hear you ask questions. As it stands, they’re simply down there, with rugged computers monitoring sundry data, fearlessly going deeper and deeper into massive nothingness wrapped up in a network of underwater tunnels, crevasses, and caves. Surely it’s awe-inspiring to be there in real life. But not so much in 3D. Throw in David Hirschfelder’s hopelessly generic score, one that sounds more like the pleasant, yet detached, score for an IMAX documentary, right down to the obligatory aboriginal chords, and the end result is a thoroughly uninvolving exercise in which a group of filmmakers indulge their own, personal obsessions. After all, Cameron is no stranger to underwater activity, having directed The Abyss and a Titanic companion-piece documentary, Ghosts of the Abyss, as well as a separate deep-sea documentary with NASA, Aliens of the Deep. Both of those documentaries were co-produced by Great Wight using Cameron’s 3D equipment, which was taken to the next level on Avatar and employed on Sanctum as well. As for that 3D, it’s decent. It’s actually above average in comparison to the bulk of recent 3D features, But even so, it’s sad to note the lack of a fully 3D sensation. The sense of depth is certainly there, but very little actually stretches out into the auditorium. In those halcyon days of 3D’s resurgence - in the 1980s - at least there were objects jabbing audiences in the eye and poking ‘em in the belly. Trouble is, those Esa’ala caves are barren. There are no schools of fish floating out amid the glasses-wearing audience. There are no exotic life-forms lurking in the darkness. Aside from some bat poop in the damp caves, there are virtually no signs of life at all, excluding those pesky, curious humans. Dang! There aren’t even space aliens in them thar caves! It doesn’t help matters any that the generic characters are brought to life by not-so-familiar faces. The biggest name is Ioan Gruffud, Mr. Fantastic in the two Fantastic Four big-screen adventures. There’s also Richard Roxburgh, who takes a dramatic turn from his obnoxious character, the Duke, in Moulin Rouge! That lack of star wattage, though, only reinforces the lack of audience immersion. Those old Friday the 13th movies were full of no-name actors. But that worked because the fun was in rooting for such-and-such sad-sack teenager to die next. In this case, there’s no real reason to root for anybody on this bland team of explorers to survive the adventure and make it back to the surface.